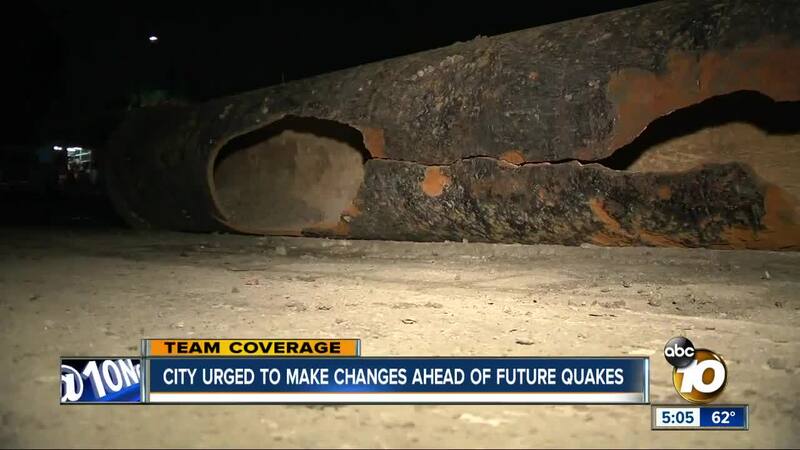 SAN DIEGO (KGTV) — San Diego City Council was recently warned about the damage an earthquake can cause to the region, specifically on the county's water system. "Strengthen their water system, make that long-term investment," seismologist Lucy Jones said of the city's aging water infrastructure. Jones recently spoke with city council leaders about improvements she's helped develop for Los Angeles' infrastructure. "[It] contributes to a much more difficult time getting your city back up and running," Jones said. Even without a shake up, residents have seen the issues with aging water pipelines under San Diego. This month, a break to an 8-inch diameter concrete main left dozens of Hillcrest residents without water. In October, a water main break to a 90-year-old, 24-inch water transmission line in North Park flooded several streets with thousands of gallons of water. A water main break occurred in the same area in January 2017 as well. Water main breaks last August in Mission Hills, Point Loma, the Midway District, and Spring Valley also left residents and businesses without water. As of August, there had been at least 29 water main breaks around the county in 2018. Since 2013, San Diego has spent about $328 million repairing and replacing 116 miles of water transmission lines and distribution pipes, according to city documents. Though, the city still has more than 3,000 miles of pipeline to replace, San Diego Pulbic Utilities Department spokesperson Brent Eidson told 10News in August . "To do it properly, we're probably always going to be replacing pipes," Eidson said. When it comes to older structures throughout the county, it comes down to what standards were used when constructing a building. 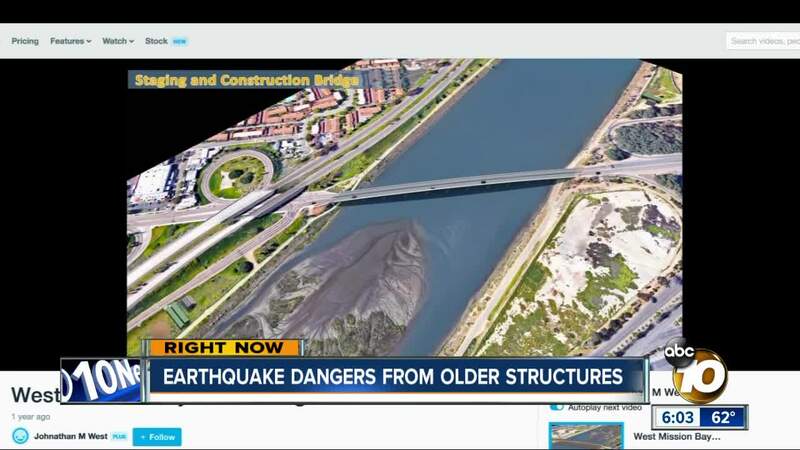 Geologist Pat Abbott says California has been proactive about preparing for earthquakes — he applauded the upgrades made to the Coronado Bay Bridge. "You have an upright here and a horizontal road bed and they don't shake the same way," Abbott said of bridge construction. "Now we know that, so for modern bridges ... the trick is tying the horizontal and vertical together so they behave as a unit." The West Mission Bay Bridge is another such example. Dating back to the 1950s, it will soon be replaced with two parallel bridges with three travel lanes in both directions, including bike lanes. The new structure is an upgrade from its current structural deficiencies. 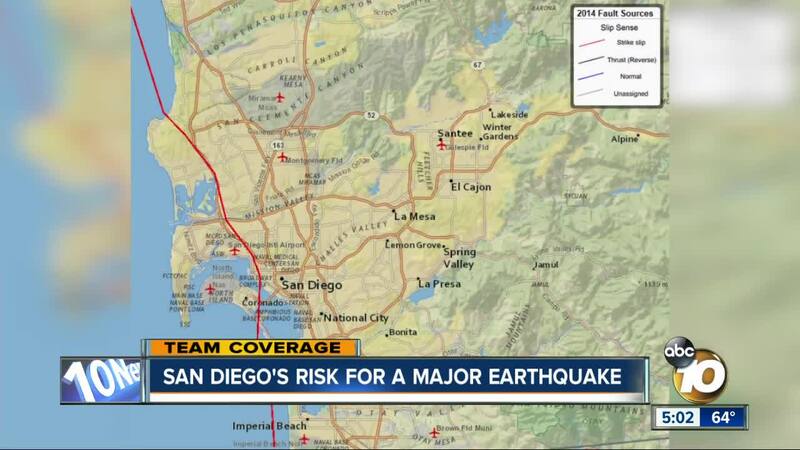 On San Diego's preparedness, Abbott says there could be some major damages. He pointed to a similar scenario that hit San Francisco in 1989: The Loma Prieta Earthquake. "Our scenario earthquake for the Rose Canyon fault, or the biggest that we reasonably expect is a 6.9," Abbott said. "If we had that earthquake we might see some major failures like [the Loma Prieta earthquake], but not widespread destruction."